This PMR study offers an eight-year analysis and forecast for the global Industrial Racking System market for the period between 2018 and 2026. This study on the Industrial Racking System market considers 2017 as the base year with market values estimated for 2018 and a forecast developed for the duration from 2018 to 2026. The Compound Average Growth Rate (CAGR), in terms of both value and volume, has been represented from 2018 to 2026. The Industrial Racking System market study covers various perspectives of the market, including market dynamics, value chain, pricing analysis, competition analysis, regional and segmental growth comparison and macro-economic and industry growth analysis, along with segment-level projections in a comprehensive manner. As per the findings of the Industrial Racking System market study and perspectives of industry participants, the global Industrial Racking System market is projected to grow at a CAGR of 7.6% between 2018 and 2026, in terms of value. Surge in trade volume exports, increased acceptance of the brand, focus on e-commerce and policy support by regional governments are the cited reasons for the strong growth outlook for the global industrial racking system market. Analysts also expect selective racking and boltless shelving segment to grow at a significant pace on the back of rising warehouse upgrade activities and a lack of warehousing infrastructure. This PMR report on Industrial Racking System carefully analyses the market at a global and regional level through market segmentation on the basis of key parameters, such as carrying capacity, design type and end use. The primary objective of this report is to offer key insights on market updates, competition positioning, current trends, market potential, growth rate and other relevant information and statistics in a suitable manner to the readers or various stakeholders in the Industrial Racking System market. Each section of the report has been structured to facilitate the reader to develop a thorough understanding of the Industrial Racking System market. This Industrial Racking System market report begins with market definitions, which are followed by the market background, market dynamics and market analysis by key segments, regional analysis and competition landscape. Each section covers a qualitative and quantitative assessment of the Industrial Racking System market on the basis of facts, historical developments and key opinions collected from industry participants through dedicated interviews with key stakeholders in the market. The Industrial Racking System market report begins with market introduction. In the next section, the report describes market development background, macro-economic factors, industry factors, forecast factors, global weighted average pricing analysis, value chain overview and an assessment of the sales of Industrial Racking System for the base year considered for the study. 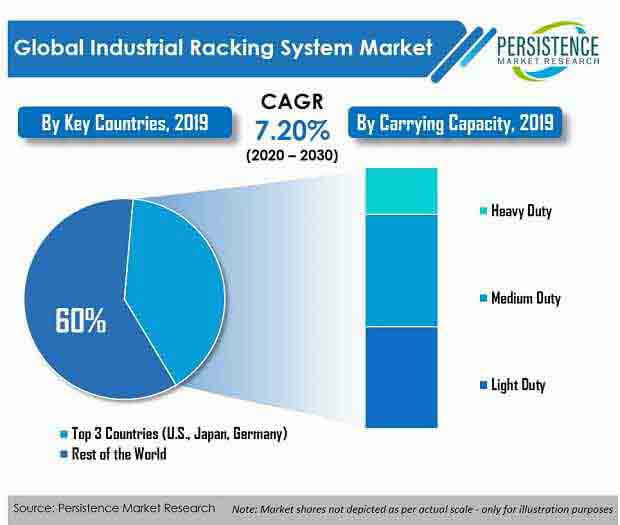 The next section of the report discusses market dynamics, such as drivers, restraints and trends, impacting the Industrial Racking System market’s growth at a global level. Market opportunities or potential for the manufacturers of Industrial Racking System have been presented in the subsequent section of the same chapter. This section also includes the impact assessment of market dynamics on the global Industrial Racking System market at a qualitative level, based on analysis facts and insights. In the following sections of the report, market value (US$ Mn) and volume (‘000 Tons) projections for the Industrial Racking System market on the basis of the aforementioned segments at a global level have been included. The next section of the Industrial Racking System report presents a summarised view of the global Industrial Racking System market based on seven prominent regions, with market numbers represented for key countries considered in the study. The section includes regional market position, growth potential, trends and market attractiveness analysis for each of these regions. The market analysis sections cover regional trends and market projections for each segment, including Y-o-Y growth trends, market share analysis, market attractiveness and incremental $ opportunity assessment. These sections analyse the degree to which the global drivers are influencing the market in each region. In order to offer an accurate forecast, we started by sizing the current Industrial Racking System market, which forms the basis of how the global Industrial Racking System market is expected to shape in future. Given the characteristics of the Industrial Racking System market, we triangulated the outcome of three different types of analysis: primary research, secondary research and PMR analysis. However, forecasting the market in terms of various segments and regions is more a matter of quantifying expectations and identifying opportunities rather than rationalising them after the completion of the forecast exercise. In addition, it is imperative to note that, in an ever-fluctuating global economy, we do not only conduct forecasts in terms of CAGR but also analyse the Industrial Racking System market on the basis of key parameters, such as Year-on-Year (Y-o-Y) growth, to understand the predictability of the Industrial Racking System market and identify the right opportunities available for the value chain participants. As previously discussed, the Industrial Racking System market has been split into four segments. These segments, on the basis of carrying capacity, design type, end use and region, have been analysed on the basis of Basis Point Share (BPS) to understand each individual segment’s relative contribution to the Industrial Racking System market growth. This detailed level of information is important for the identification of various key trends being witnessed in the Industrial Racking System market. Another crucial feature included in PMR’s comprehensive report on the Industrial Racking System market is the analysis of all key segments in the Industrial Racking System market and regional adoption, along with the revenue forecast in terms of absolute dollar opportunity. This is traditionally overlooked while forecasting the market; however, the absolute dollar opportunity is critical in assessing the level of opportunity that a provider can look to achieve in the Industrial Racking System market. In the final section of the Industrial Racking System report, a competitive landscape of the Industrial Racking System market has been included to provide report audiences with a dashboard view, categorised on the basis of providers present in the value chain, their presence in the Industrial Racking System market and key differentiating factors and strategies. The primary category of providers covered in the report are the manufacturers and end-users of Industrial Racking Systems. In addition to this, the section is primarily designed to provide clients with an objective and detailed comparative assessment of the key providers specific to a market segment in the value chain of the Industrial Racking System market. Detailed profiles of providers of Industrial Racking System have also been included under the scope of the Industrial Racking System market report to evaluate their long- and short-term strategies, key offerings and recent developments. Some of the key competitors covered in the report include Kardex AG, Daifuku Co., Ltd., SSI Schaefer, Foothills Systems, Hannibal Industries, Cornix SA, Gonvarri Material Handling, ARPAC, AK Material Handling Systems, North American Steel Equipment Inc., EMRACK International, PROMAN, s.r.o., Nedcon B.V., Averys SA, Jungheinrich AG, Mecalux, S.A. and AR Racking, Ridg-U-Rak Inc. among others. The report covers comprehensive information about market trends, volume (‘000 Tons) and value (US$ Mn) projections, market dynamics, competition landscape and recent developments regarding the global industrial racking system market for the study period 2018 to 2026. The global industrial racking system market is expected to reach over US$ 19,040.8 Mn by the end of the forecast period, registering a CAGR of 7.6%. According to the analysis, the demand for industrial racking systems is expected to keep increasing and gain significant traction in the coming years. Increasing installation of industrial racking systems in Ecommerce and 3PLs for retail & general purposes and growing demand from the food & beverage industry, among others are expected to reinforce the outlook of the global industrial racking system market. The market, on the basis of design type, has been segmented into racking and shelving. These are further segmented on the basis of design type and the type of application in each end-use. In terms of value, the racking segment is expected to dominate the market and grow with a volume CAGR of 7.4% during the forecast period. On the other hand, among racking type segments, in terms of value, the selective racking segment is estimated to account for a share of 29.4% by end of 2018. However, the segment is expected to witness relatively steady growth during the forecast period. Strong labor market recovery, including increasing employment and decreasing unemployment rates, is also driving household spending. Such trends are further fuelling the demand for warehousing space and thereby, influencing the global industrial racking system market. Logistics is one of the most important basic industries in any economy as it deals with the management of the flow of products from the place of their origin to the place of their consumption and thus, the industry also involves the integration of material handling, warehousing, packaging, transportation, inventory management, supply chain management, procurement and shipping security aspects. The global logistics industry mainly comprises a complex range of freight and cargo related transportation sectors. According to the analysis, the total global logistics market reached a value of about US$ 7.2 Trillion in 2017, representing almost 9% of the global GDP. The logistics sector is expected to grow at around 10%-15% in the forthcoming years, largely attributing to growth in retail, E-commerce and manufacturing sectors. Warehouse construction and U.S. freight are skyrocketing; however, U.S. exports are declining, pointing to a growing and stronger U.S. economy. Furthermore, shortage of modern warehouse facilities will lead to tough competition for space among E-commerce players in the U.S. Given the lack of modern warehouse space and the rise of E-commerce in the U.S., there is a huge opportunity to develop new warehouses and rebuild old ones to ensure that they meet modern requirements. The U.S. total warehouse inventory, which is becoming increasingly obsolete at an average age of 34 years, will proliferate the development of new warehouses spaces and augment the sales of industrial racking systems. This trend to invest in the development of better urban warehouses is also significant in Europe. The industrial racking systems market benefits from the key drivers of economic activity, including consumption, E-commerce, supply chain modernization and urbanization. In the developed markets of the U.S., Europe and Japan, the reconfiguration of supply chains (strongly influenced by E-commerce trends) is a strong factor impacting the market. Whereas, in emerging markets such as Brazil, China, India and Mexico, affluence and the rise of a new consumer class have increased the need for modern distribution networks. India, being at the forefront in terms of growth rate, is set to observe substantial investments in E-commerce and manufacturing sectors. Importantly, the initiatives being taken by regional governments are likely to encourage the movement of low-cost manufacturing towards parts of South-East Asia and Africa, while new transport corridors will provide significant opportunities in the logistics sector as supply chains are upgraded. The global industrial racking System market is highly fragmented where tier-3 players account for a dominant share in the global market. Moreover, local/domestic manufacturers hold the dominant positions in their respective regions/countries. The presence of a large number of players is intensifying competition at a country level in the global market. In the recent past, the industrial racking system market has witnessed significant developments from a competitive perspective. Product innovations, mergers and acquisitions are some of the preferred strategies opted by key players to sustain and enter in the global industrial racking system market. Major companies are focused on updating their product portfolios. Prominent players covered in the industrial racking system market report include Kardex AG, Daifuku Co., Ltd., SSI Schaefer, Foothills Systems, Hannibal Industries, Cornix SA, Gonvarri Material Handling, ARPAC, AK Material Handling Systems, North American Steel Equipment Inc., EMRACK International, PROMAN, s.r.o., Nedcon B.V., Averys SA, Jungheinrich AG, Mecalux, S.A., AR Racking and Ridg-U-Rak Inc., among others. How has the industrial racking system market evolved over the past five years? How is the industrial racking system market expected to take shape in terms of volume and value during the study period? What are the prevailing market dynamics in the industrial racking system market? What are the competition developments and trends in the industrial racking system market? What are the underlying macro-economic and industry factors impacting the growth of the industrial racking system market? Which are the key challenges, opportunities and improvement factors for industrial racking system market players? What are the market positioning and key strategies of key manufacturers as per the industrial racking system market taxonomy? How is the competition structured in the industrial racking system market and how has it evolved over the past few years? North American Steel Equipment Inc.